"It's been fun, and I thank you for this opportunity to remain - on the loose." The Unknown Jonathan Winters: On the Loose is a biographical television documentary about the rotund, vocally versatile, influential comic who reached the height of his popularity in the 1960s and 1970s. 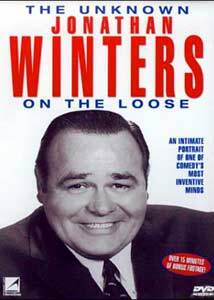 The program covers Winters' life and career, with extensive new footage created with the cooperation of Winters and his family, and includes numerous vintage television clips. While similar in style to the popular A&E and E! cable network biography programs, The Unknown Jonathan Winters is both helped and hindered by the presence of the man himself. His own reminiscences serve as the program's narration, linking still photos and film clips into a rough map of his life and career. His wife and children are on hand to share their memories, and the program gains a great deal of intimacy from their involvement. It's a warm look at a man whose talent shaped American comedy in many ways—he was particularly inspiring to a young Robin Williams, who also appears in this documentary to discuss Winters' influence and their work together, as does Andy Williams (no relation) whose TV talk show frequently featured Winters as a guest in the 1960s. Winters discusses his paintings—a recent artistic outlet—and we even see him going about his present-day life, doing his banking and improvising with the staff in an affable, pleasant, often hilarious manner. The Unknown Jonathan Winters is still entertaining and insightful enough to be worth viewing; Winters is fascinating to watch, and he can be hilarious when running at full tilt, his comic brain running too fast for any of us to keep up. But the program leaves a slightly unsatisfying aftertaste, smacking a bit of the "puff piece" despite its straightforward approach and Winters' commendable forthrightness. There's something lacking in the production's structure, which its charismatic subject can't quite overcome. Image Transfer Review: The Unknown Jonathan Winters is presented in its original 1.33:1 made-for-television full-frame aspect ratio. Most of the clips are from television appearances, though a brief clip from It's a Mad, Mad, Mad, Mad World is letterboxed to preserve the original 2.35:1 aspect ratio. The show's broadcast-videotape origins are apparent—scan-line and digital editing artifacts (on still images) turn up frequently. Footage is drawn primarily from videotape and kinescopes of varying quality; the image is generally soft but clean, and the transfer seems solid enough given the source. It's a typical television documentary, visually unimpressive but perfectly watchable. Audio Transfer Review: Fox Lorber's The Unknown Jonathan Winters is presented with a Dolby Digital 2.0 monophonic soundtrack, ProLogic-decoded to the center speaker. All of the archival clips as well as the newly-created interview segments are monophonic. The sound quality is quite good considering the condition of some of the vintage television source materials: clear and comprehensible if unspectacular. Billed on the DVD menu as "Good Humor Commercial", this is actually a series of improvisational outtakes by Winters on the set of a Good Humor TV spot in which he plays a grizzled prospector talking about Good Humor products—and his faithful mule. Winters' style is much in evidence here, as his riffs on the prospector theme evoke audible guffaws from the crew, though one wonders whether a usable commercial came out of this session! Thirteen US TV spots for Hefty Bags and derivative Hefty products, featuring Winters in multiple roles as he demonstrates the quality of the manufacturer's trash bags. These are played relatively straight by Winters' standards, and the sheer quantity becomes slightly numbing after a while, but it's nice to have these vintage spots included. A very brief bit of leftover footage from Winters' debut TV appearance on Chance of a Lifetime, most of which is seen in the documentary proper; this extra bit of wrap-up adds little of value. Another disappointing extra, this features two short bits of footage from Winters' own TV show as he improvises around a dinner table theme. These clips are funny, but don't provide a good picture of the show in general. These are essentially deleted scenes from the new footage shot for this documentary, featuring Winters impersonating a gas station attendant (to the bewilderment of an unsuspecting customer); joking during his makeup session; begging the audience to write and send five dollars, and talking to the producers about how much they'll probably end up cutting from the show. It's entertaining footage and a worthwhile inclusion. The Unknown Jonathan Winters: On the Loose is an intimate biographical documentary about the influential comedian's life and career. Fox Lorber's DVD is competently presented with substantial supplements and plenty of Winters performance footage (onstage and off). Not as comprehensive as it might be, but still worth a look.